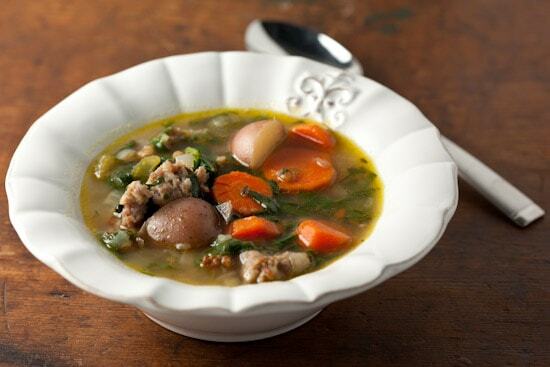 This hearty spinach and sausage soup with barley is the perfect thing to welcome the chilly nights of fall. It’s a simple soup that can easily be customized to suit your own taste, so experiment and enjoy! I’m thrilled that Fall is here. The days here are still really warm but the nights have been cooling down nicely allowing for perfect brisk mornings that make me dream of pumpkin carving and apple pies. But spinach? I can’t say I dream of that often. Well, spinach is the theme for this first week of Fall Fest so I pushed aside my thoughts of pumpkins and apples and decided to make a hearty spinach and sausage soup chock-full of vegetables and barley, perfect for the cooler weather that seems to be on its way. I bought spinach and sausage specifically for the soup, but the rest of the ingredients were just things hanging around my kitchen that needed to be used up. Please just use the recipe as a jumping off point and feel free to throw in whatever you happen to have hanging around your kitchen. I think this soup would be very good with white beans or pasta if you don’t want to use barley. To tell you the truth, I had intended to use barley but accidentally threw wheat berries in there instead (this is one of the problems with buying grains in bulk and then forgetting to label the bags). The wheat berries were fine, though they took longer to cook than the barley would have. But I really wanted barley in the soup, so that’s what I listed on the ingredient list below. Beans, barley, pasta, rice—do whatever you want! Even with the accidental wheat berry addition, I adored this soup. The spinach, sausage, and chunky potatoes were a great combination and I know that it will taste even better once it sits overnight. Can you guess what I’ll be eating for lunch this week? Heat olive oil in a large pot over medium heat. Add onions, carrots, and celery and cook, stirring occasionally, for 8-10 minutes or until onions are softened. Add potatoes, 5 cups of stock, and barley. Turn up heat, bring to a boil, then reduce heat and simmer uncovered for 30-45 minutes or until barley is tender. Meanwhile, squeeze sausage from its casings, crumble and brown it in a skillet. Drain fat and set the sausage aside. 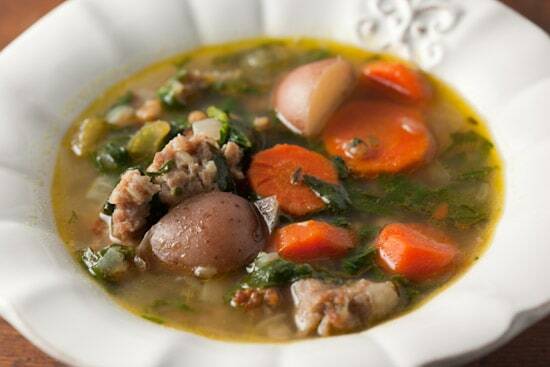 When barley is tender, add spinach and sausage to the soup and fresh herbs if you are using them. Add more stock if necessary or desired, bring soup back up to a simmer and let cook for another 15 minutes. Season to taste with salt and pepper. Love this one! I make a similar version with escarole and beans. It's a perfect "no fuss" weeknight meal. Nicole, this soup looks wonderful and hearty. Regardless of whether there's wheat berries or barley in there (or both!) I could definitely sit in front of a huge bowl. This soup looks delish. To make it skinny I'd use a reduced-fat sausage and reduced-sodium chicken broth.Can't wait to try it! Falling leaves and pumpkins aside (for the moment), nothing says autumn like hearty soup. This looks lovely! It looks so yummy and comforting. I find that the most delicious creations come out of the need to use what you already have in your pantry. Nicole, This looks amazing. I love the broth as well as the spinach and sausage combination. I can't wait to try this. This looks so good. Might substitute the potatoes with sweet potatoes. The carrots look divine! there are so many simple soups that can be whipped up on a weeknight, but never too many that there isn't room for one more. THANKS! I eat soup for lunch every day in the winter! I'd like to try this once the weather gets a little cooler! I love hearty soup recipes and this one sounds great. I do a similar version with kale, but I love spinach and we would devour this. Fall Fest sounds amazing, I am going to join! This recipe looks great, healthy and full of protein to keep you going. I'll be trying it tomorrow. When I first looked at this photo, it looked almost like Zuppa Toscana soup to me (something I've wanted to recreate for a long time) but it has spinach instead of kale. It's too hot right now to think about soup though, but this reminded me I want to make some when the weather gets cooler again (hopefully soon!). This looks warm and tasty! I had to mention it in my latest blog post: http://www.hungrycook.com/2010/09/28/fall-feasting/. Can't wait to try it! I'm making this soup right now. My house smells so good. I can't wait to taste it. I just came across your health and fitness blog. Your article about the spinach and sausage soup was especially interesting. I especially liked your comments about staying healthy by using what ingredients you have in your kitchen already. I am adding you to my favorites. We're in the same industry, the business of encouraging health and fitness. We market a product called The AbStand: http://www.theabstand.net. We would love for you and your readers to check out our ab workout product. Any feedback would be appreciated as well. Thanks! Mmmmmm just finished making this for dinner!!! I added leeks and mushrooms. I love soups! Can't wait to eat it! Next... its that time of the year again to start making pumpkin spice cake with pumpkin cream cheese spread!!!! Thanks for all your yummy recipes! Nicole, This soup was so good and froze well. So good in fact, I'm making it again. Thanks for this great recipe. The days here are still really warm but the nights have been cooling down nicely allowing for perfect brisk mornings that make me dream of pumpkin carving and apple pies. I learned to make it work, while Madame like to make it in a pressure cooker. It is also a favorite winter soups. Just made this soup yesterday. Used one link of mild Italian sausage and one link of spicy Italian sausage from Whole Foods. It turned out really good. Thanks for sharing your recipe.